Motorola has done a pretty remarkable job at keeping its next flagship, largely thought to be dubbed the Moto X+1, under wraps. 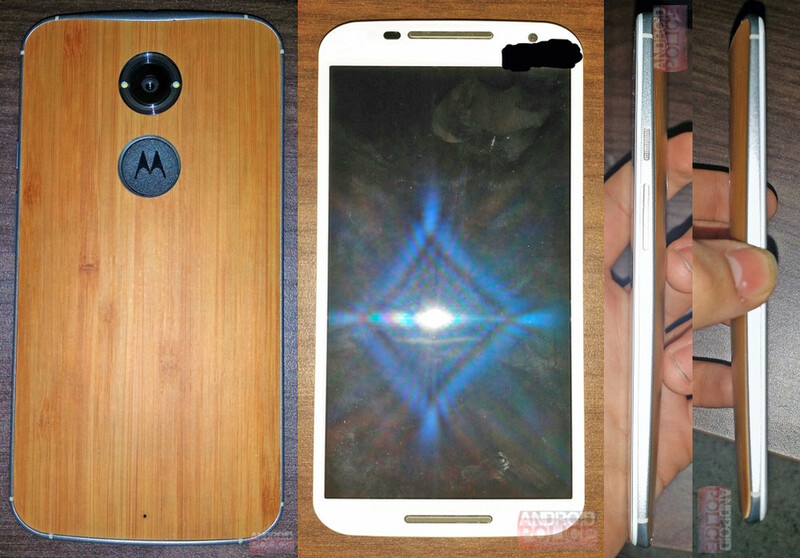 And then a couple of hours ago, a whole series of pictures of a device that may just be the next Moto X, leaked in a big way. We are talking front, back, side, top, bottom angles of a phone with a wood back, large camera sensor, and Moto X styling throughout. Let’s talk about it. According to a report out of Android Police, this device has a custom wood back, just like we saw on the original Moto X, only the quality may have been stepped up a notch thanks to the inclusion of a metal banding around the outside of the phone that is said be aluminum. We have front facing speakers, similar to those found in the Moto E. The headphone jack is up top, which has now been joined by the SIM card tray. Volume and Power buttons sit on the right side of the device together, just like they did on the original. The device is said to come in white or black, wood (obviously), and leather in at least two colors (blue and purple). Motorola told us back in May that MotoMaker would not go away, so there is a good chance that we will see even more customizable options. I haven’t mentioned the back much yet, because there is some interesting stuff going on there. As you likely noticed, the camera sensor looks large, very large. It is flanked on each side by a dual-flash setup, and sits just above a mostly awkward-looking Motorola logo made of plastic. If that looks familiar, that’s because you just saw the back plate for one of the new DROIDs with the exact same setup, only the Motorola button was missing. Rumors leading up to the launch of last year’s Moto X claimed that Motorola was working on turning the phone’s rear dimple into an actionable button or touch sensitive area. That feature was reportedly scrapped, but it looks like Motorola has gone forward with the idea in this year’s Moto X and DROID line. It’s tough to guess what that button could be used for, but it could be for controlling music with the screen off, launching favorite apps, etc. Specs were not confirmed through this leak, though a micro SD card slot does not appear to be present. No new launch dates have been rumored or announced. At this point, we are still expecting the phone to arrive some time this summer. Thoughts? Is this your next phone?